The American Society for Concrete Contractors will hold its 17th annual conference September 20-23 at the Sheraton Charlotte Hotel, Charlotte, N.C. Concrete contractors, manufacturers, designers and other industry professionals will gather for three days of educational events and networking. LafargeHolcim has acquired Tarrant Concrete Co., which operates three ready mixed plants on two sites, and builds on a Dallas-Fort Worth Metroplex platform created under Holcim (US). 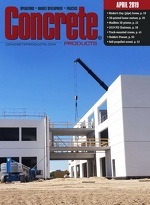 With 90 employees and annual sales hovering $40 million, Tarrant Concrete becomes the first bolt-on transaction in domestic ready mixed production since the Aggregate Industries U.S. and Holcim (US) businesses, along with Lafarge North America, were brought under LafargeHolcim Ltd. in the 2015 Lafarge Group and Holcim Ltd. merger. Terex Advance and Terex Services have announced a cooperative agreement to enhance customer service to concrete producers and mixer truck owners across the United States. It will augment the services and repairs of Terex Advance customer equipment by providing on-site support and parts at Terex Services facilities. The program will start at Charlotte, N.C., and Whitehouse, Tenn., facilities, with intentions to expand the support offerings coast to coast.